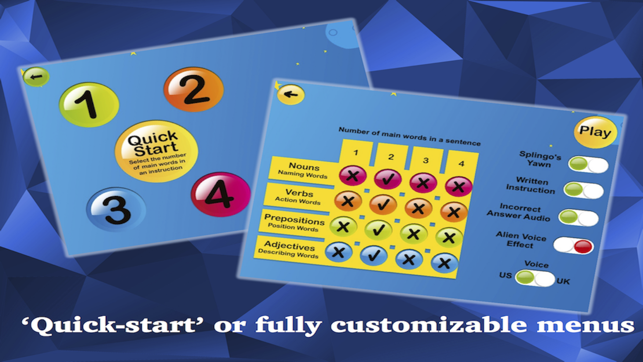 An exceptionally high-quality, interactive game designed by Speech and Language Therapists/Pathologists to help children learn listening and language skills, from the authors of Receptive Language Assessment with Splingo, Pronouns with Splingo, Categories with Splingo and Actions with Splingo apps. 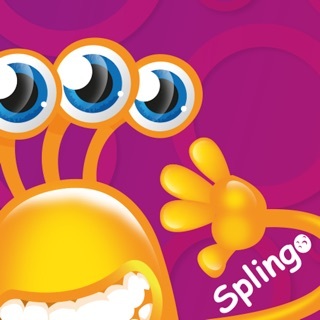 With thousands of different word and sentence possibilities, as well as US or UK voice options, Splingo the alien’s spoken instructions will guide your child through a galaxy of language learning. 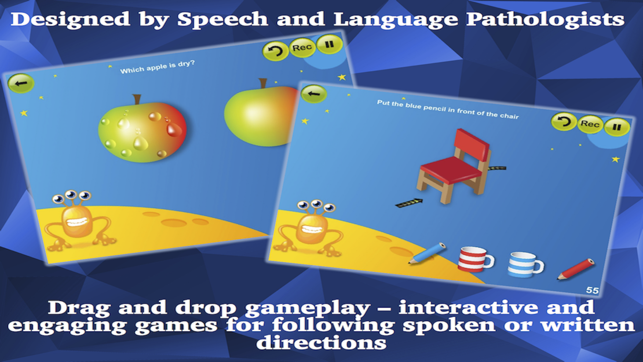 Your child will practise their listening and language skills by interacting with the images and animations on the screen to follow Splingo the alien’s spoken instructions. 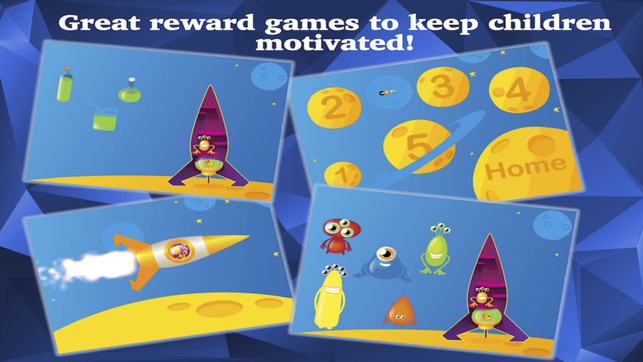 As a reward, they will love helping Splingo build a space ship and complete the tasks in order to get him home. His hilarious animated responses will capture your child’s imagination. Splingo’s instructions range from a very early level of language development, e.g. single word recognition, to much more complex, e.g. instructions combining several aspects of language at once. 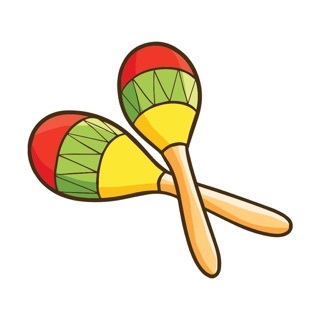 While your child is experiencing an entertaining, motivating game, you can be reassured that they are learning a variety of different aspects of language, including naming words (nouns), action words (verbs), location words (prepositions), description words (adjectives), e.g. color, size and much more! 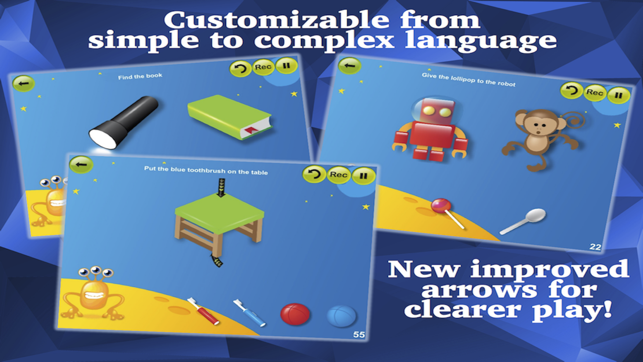 The game is completely customisable so you can create a combination of levels and word types to suit your child’s developmental level. "The children all love Splingo...especially the encouraging words (yep,yep,yep, ooh whoo etc!) and the rocket! The pace is great for speech/language delayed children." At the Speech and Language Store we take your privacy seriously. As parents ourselves, the safety of children online (and any everywhere else!) is extremely important to us. We do not collect personally identifiable information within our apps (for example first and last name, address etc). Identifiers from your device are only collected for internal usage to help improve app design and performance. For example information is collected on app crashes, number of installs (sales) and app usage time. This is collected through a third party provider; Flurry which is part of Yahoo (https://developer.yahoo.com/analytics/). The restricted version of Flurry Analytics ("Flurry") is used. 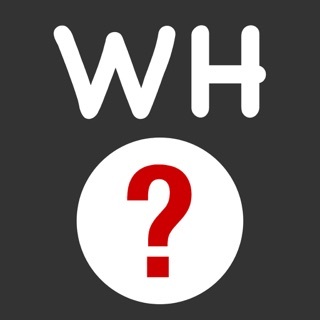 We do not track any more information than is necessary to improve the quality of our apps and services. The information collected by the third party provider is used solely by us and not shared with anyone else. Our apps do not use or collect a user’s geographic location. Our apps may contain links to our website and Facebook/Twitter pages. 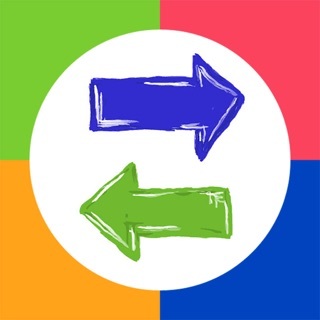 These links are found on a contained, adult-targeted settings screen separate from game play screens, and are for parents/professionals to find out more about our apps. In our newer apps these links are behind a parental gate, which requires the user to follow a written instruction to gain access. We are currently in the process of updating our existing apps to include this feature. I've always thought this was a good app, but the update has improved it. For example it is a little clearer now what objects belong to which person for possessive-s directions. The British accent during the reinforcement is a very minor flaw for U.S. listeners, since it is not used during the stimuli portion it is not problematic in my opinion. I also like that you can turn off the "uh-uh" (no you're doing the wrong thing) responses. My autistic kids were upset by that correction. I agree with another reviewer who said it would be nice if you could choose some of the items you do or don't want presented so that you might focus on specific language targets. Although it is a little clearer now which objects belong to which character (possessive -s is the target) this still needs more clear delineation such as 2 boxes containing with each character and their objects. The idea of the app is great. However, the praise phrases are a bit boring. The reinforcement of building the rocket is fun. Most importantly, it would be PERFECT if you could actually SELECT which nouns to work on. This is why I bought the app because it said customizable— not very customizable. I work with kids with disabilities and they need repetition, not new words each time.